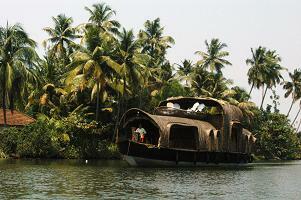 Kerala houseboats or 'Kettuvallam' are giant boats with wooden hulls and a thatched covering. Kettuvallam is a Malayalam word meaning 'kettu' tying and 'vallam' country boat. Kettuvallam were originally used to transport huge quantities of rice and spices to the Kerala sea ports. Nowadays, they generally transport tourists and not spices, with many converted to offer luxurious accommodation. Are you able to recommend a houseboat cruise? Do you have any questions to ask? Follow the links to contribute to our site and appear live on the web! The backwaters of Kerala are undeniably beautiful, with wide lakes lined by palm-trees, lazy rivers walled-in by tropical vegetation and narrow canals covered in green canopies. All of this lit up from time to time by the flash of a woman's red sari, or the vivid blue of a diving kingfisher. There are many ways to explore the backwaters, but by far the most luxurious is on the Kerala houseboats. Trips can be organised for half days, but overnight stays are the most popular. On board the boat is converted to include bedrooms, bathroom, living space and a kitchen. The crew is usually two or three, one of whom is a chef that will cook authentic Keralan food. Drinks can be arranged beforehand, so as you enjoy your meals sat in the open area at the boats helm, you can sip on a beer and watch the scenery slowly change and other crafts pass by. Smaller crafts are suitable for couples, though Kerala houseboats with 7 doubles are also available. Expect to pay from R.4500 (at time of writing £66, Euro 75 or US $100) for a stay of 24 hours for two people sharing. This is a big expense when in India, considering luxury accommodation on land can be found for as little as R.1000, but many people see it as a once in a life time experience. It is often cheaper to organise a boat between a few friends or couples. The more luxurious boats and those with AC may increase to R.6000-R.9000 for a couple. Check whether food and refreshments are included in the price before you book a trip. Peak season (December and January) may also inflate the rates. It is possible to book day trips on a houseboat if you do not want to spend the night. Often the price includes a traditional Keralan meal and is significantly cheaper, though you do not get to watch he stars! Internet bookings for Kerala houseboats are becoming increasingly popular, and will save you a lot of investigation work and decisions once there. Your booking will be secure (useful in busy periods) and you will have a website to refer to when finding out what is included in the tariff. Alternatively, find a deal once you arrive. Many tour operaters, hotels and tourist information centres will organise trips. The backwater destinations of Alleppey (where you will have the biggest choice but the busiest waterways), Kottayam and Quilon yield plenty of options, as will Kochi. Compare a few options before committing, and consider asking to see the boat. For cruises in other areas of the backwaters, try local tourist information centres or hotels. Competition outside of the hubs is not so demanding, so make sure the standards are high. The waterways will be quieter in these areas. See the backwaters of Kerala page for alternative areas from which to organise cruises. A huge number of boats ply the Keralan backwaters, especially in the tourist destinations of Alleppey and Quilon. The petrol propulsion of many of these boats is having a negative impact on water purity in the area, threatening wildlife. Waste from the boats such as plastic bottles, food containers etc is also a problem. Fortunately there are growing numbers of eco-friendly Kerala houseboats available for tourists to the region (more info below), and local operaters are beginning to wake up to the problem. Taking public transport on the backwaters, or choosing backwater cruises that transport larger numbers is one way to see the scenery but have a low impact. 'Eco-friendly' tourism is growing in Kerala and especially in the fragile environment of the backwaters. Choosing a houseboat that has no engine but is propelled by punting is the best way to minimise your impact. Distances travelled are smaller, and these boats are not suitable for large groups i.e. big boats, but the journey is quieter and the experience more authentic. Some boats running on solar panelling are also available. Tourist information centres will provide details of eco-friendly Kerala houseboats, consider asking about propulsion and waste disposal. You can also book ahead of time online, including 'eco friendly' in your search. Try www.cocohouseboatskerala.com. On board you can further minimise the impact by reducing your waste (consider buying water purifying tablets rather than plastic bottles, dispose of plastic and paper waste carefully). Want to find out about other methods of transport in India? Our getting around guide gives advice and useful tips about the modes of transport you are likely to come across while travelling in India.